This is the first of 4 books comprising a Monograph on the Poetry of Wilfred Owen – with emphasis on the unfinished or incomplete poems – particularly Strange Meeting – all these ‘new’ poems are rendered into reading and performing versions – about 80 ‘new’ poems in all. 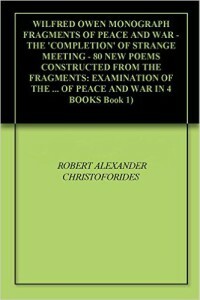 This first book also includes several essays. It is available to purchase on Amazon Kindle. The estimated length of 427 pages is calculated using the number of page turns on a Kindle, using settings to closely represent a physical book.